Just a quick update on how my decluttering is going, it’s going extremely well. It’s becoming easier, but I still feel like I haven’t had to make too many hard decisions yet. Some days I do more than 5 items, but I always do at least 5. I’m going to be traveling for work next month, so I’ll have to make up the items either before or after I go. Luckily I’ll be home on weekends. I started my Purge on 12/17/14. There have been 38 days since then, meaning I have thrown out or donated at least 200 items. Some days I don’t feel like it, so on those days I kind of phone it in. College Me thought it was important to have a bazillion pairs of underwear instead of doing laundry more than once a quarter, and several years ago I put a ton of underwear in a basket in my closet, and some days I just pick 10 and pitch them. One day I was just going to clean out the fridge and count that, but then later when I was setting out my clothes for the next day I realized I couldn’t find a tank top I wanted. In searching, I found over 5 items that I should donate, so I added them to the Goodwill pile. So this morning I went to my closet to find my 5 items to donate or toss. I have a lot of old purses, so it’s something I can just grab and get done so I don’t have to worry about it in the evening. Most of my purses had something in it- gum wrappers, time of the month products, etc. But one held the oldest items I’ve found so far. 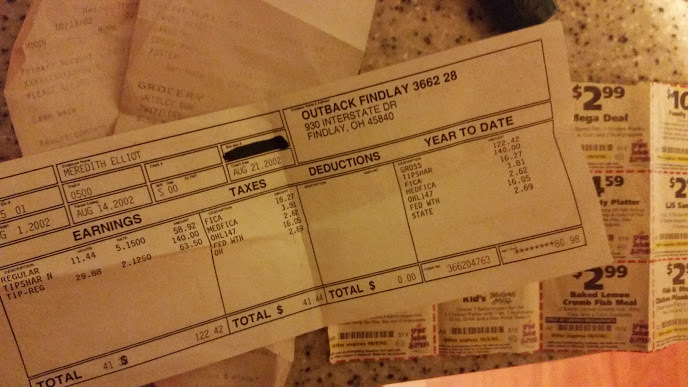 Yep, that’s a paystub from August 2002 from my brief time at Outback Steakhouse. I worked there the summer between high school and college. Those coupons are for Long John’s Silver and expired October 5, 2002. The receipt is from Meijer, 10/17/02. I bought gum, blow pops, Twizzlers, a candy necklace, a poster, and a large hook. I also found anti-bacterial hand gel that was completely liquified. It expired in 2000. I’m trying to remember myself in 2002. I was so excited for college. I was ready to make new friends, have new challenges, and escape the small town of Ada. I’ve been with my husband since April 2003, so this even pre-dated him. After multiple trips to goodwill, and multiple trips to the garbage can, I now have an office/dressing room I can use without dancing around debris on the floor. I can actually sit on my desk and USE it. I could lay on the floor if I wanted to! I still have a ways to go, my drawers aren’t all closing, my closet is a mess, and I still have clothes in storage that I should probably just donate without looking at. But I have stuck to my resolution of finding 5 (or more) items everyday to donate or toss. 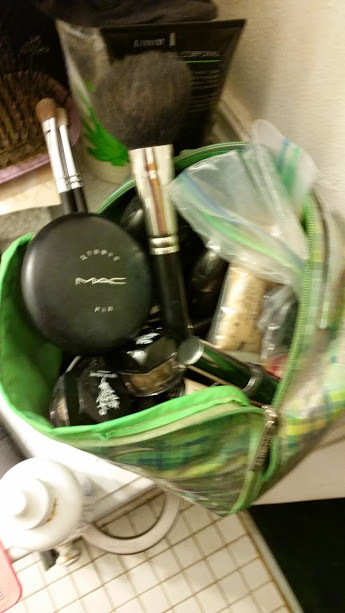 I threw out my old makeup bag that had dust in it (GROSS) and transferred only the makeup I use to a new bag and threw out the rest. I have a designate place to put items that will end up at Goodwill, once I fill up a bag I’ll drop it off. It is so nice to get ready in my room now, and be able to see all of my jewelry options and not have to get dressed in the hall. 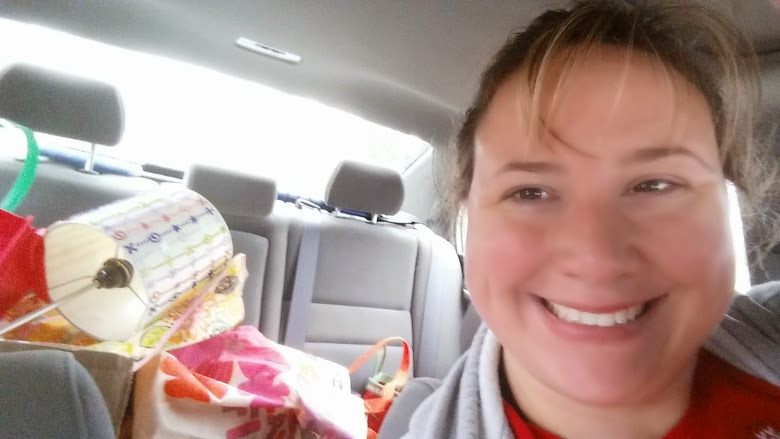 Happy smiles on the way to Goodwill! I threw away over 10 old items from my makeup bag and now my daily use items fall to the bottom. Since my last blog I have discarded or donated at least 5 items each day I was home. I was gone two days, but I had donated a bag of clothes to make up for it before I left. It’s still fairly easy, I haven’t had to make too many tough decisions yet. I’ve donated items I never wear, some were my sister’s that she gave me when we were both losing weight a couple years back. I’ve thrown away expired medicine, makeup, and more. Things in the past I would have kept “just in case”. But NO more. I have already been better about buying things I don’t need – really pondering – do I REALLY need this? How much would I wear it? Where will I keep it? etc. I’m really proud of myself. I know it will get harder, but the thought of being able to always put clean clothes back in drawers is my light at the end of the tunnel. I found this Decluttering guide on Facebook and I plan to follow it. Who knew you could donate old Christmas cards? My mission for this weekend is to clean out my office/dressing room. I am taking everything out but heavy furniture and putting it in my husband’s office next door. Then I’ll vacuum and be judicious about what goes back in. It’s pretty gross, but the carpet hasn’t been vacuumed in probably over a year. because it’s been covered with stuff. Next I will empty all of my dressers and purge those of clothes I can’t remember wearing. I’m planning on getting a smaller desk so that I can have more storage space and will be less likely to use my desk as a shelf. I do sometimes work from home, so it will be nice to have a set place. I won’t tackle my closet just yet – once my room is back in order I’ll have a closer space to sort and purge. That will be a project for another weekend! It was a lot harder than I expected and required a lot more money than I wanted to spend. So I gave up. Sadness. But now I am going to use my blog for something better. To chronicle my new adventure of GETTING RID OF STUFF!! My official 2015 New Year’s Resolution. I have too much stuff. I have clothes over a decade old that don’t fit and/or shouldn’t be worn in public. I have makeup from high school that is unsanitary and needs to be tossed. I am a hoarder in the making who attaches emotions to objects. I have a whole extra bedroom as my personal closet and it’s not enough. So my NY Resolution – EVERY day find FIVE items to either throw away or give to Goodwill. Items will immediately go into the garbage or a bag to take to Goodwill when filled up. When I can put clean clothes in drawers, stop using the floor as a shelf, have a closet I can get in and out of and use to store current clothing, and have a desk I can actually work on, I can stop. I posted it on Facebook and my friends posted so many awesome things that I got super excited and started early. Today I went through my makeup in the bathroom and threw out 5 things. One was eyeshadow from 1998. GROSS!!!! !